On Sunday May 5th five Firefighter/EMT candidates sponsored by the Brewster Fire Department graduated from the Barnstable County Fire Academy after an intense 16 week Firefighter I/II training program encompassing both classroom and hands-on fire training. The academy curriculum included fire department skills such as the use of self contained breathing apparatus, engine company operations, ladder company operations, hazardous material response, rapid intervention procedures, firefighter survival techniques, ventilation practices, use of ropes and knots, fire safety education, basic fire dynamics, and live fire training. 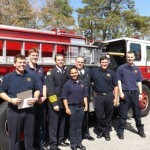 The students were instructed throughout the program by an expert group of County academy instructors hailing from a variety of Cape Cod fire departments. In addition to the training and County certification received from attending the program the students have also been prepared and will be provided the opportunity to obtain State and National Firefighter I/II certification through the State Fire Academy in the next few months. 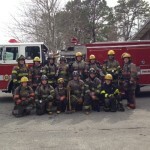 The Brewster Fire Department would like to congratulate our group of firefighter candidates for the hard work and dedicated efforts they exhibited in attending and graduating from this demanding program. We look forward to bringing a number of these certified firefighter/EMT’s into the department over the next several weeks as we initiate a strategy to fill a number of roster openings. The following individuals were sponsored by the Brewster Fire Department during the program. BREWSTER — Firefighters are known for running into fires when everyone else is running out. More than ever, however, when duty calls, they also dive into water, drop into trenches and respond to terrorist attacks. 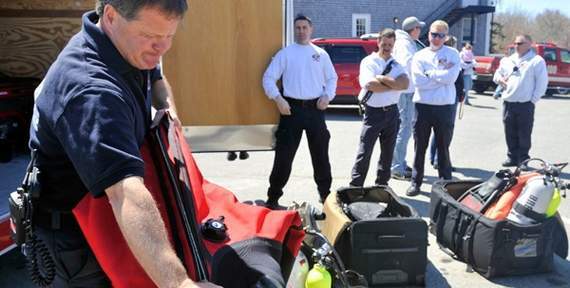 On Monday at the Brewster Fire Station on Route 6A, Cape Cod fire officials announced a $239,758 Homeland Security grant for a new Capewide dive team that could respond to potential terrorist threats or attacks on ferries, the Cape Cod Canal bridges and other infrastructure. On Wednesday May 1 at 10:02 a.m. the Brewster Fire Department responded with Ladder 237 and Car 232 (Deputy Chief Harrison) to 65 Ryder Road in the Town of Harwich on an automatic line box assignment for a reported structure fire with burn victims. On arrival, Harwich Fire Department units found a working fire in the garage area of a 1 ½ story wood-frame private residential dwelling. With a heavy smoke condition present throughout the entire structure Harwich firefighters initiated an aggressive interior attack using multiple pre-connected hand lines in an attempt to confine the fire and prevent further extension into the residence. Ladder 237 was assigned as the Rapid Intervention Crew (RIC) for the incident and Deputy Chief Harrison was assigned as the Safety Officer. After approximately 45 minutes the Incident Commander declared the fire under control and began releasing mutual aid units back to their local jurisdictions. One victim was transported to Cape Cod Hospital with non-life threatening injuries. Ladder 237 and Car 232 were placed back in service at 11:02 a.m.
On Sunday May 5 at 3:03 p.m. the Brewster Fire Department responded to Kelly Way in the Town of Dennis on a mutual aid request for personnel and apparatus to assist at the scene of a 2 ½ acre brush fire. A full department tone was sounded and two Brewster brush units (238, 240) responded to the incident. On arrival the apparatus and firefighting staff was utilized to contain several areas of fire that were located in close proximity to a number of residential homes along one of the fire lines. After operating at the scene for approximately 1 ½ hours the Incident Commander declared the fire under control and began releasing mutual aid units. 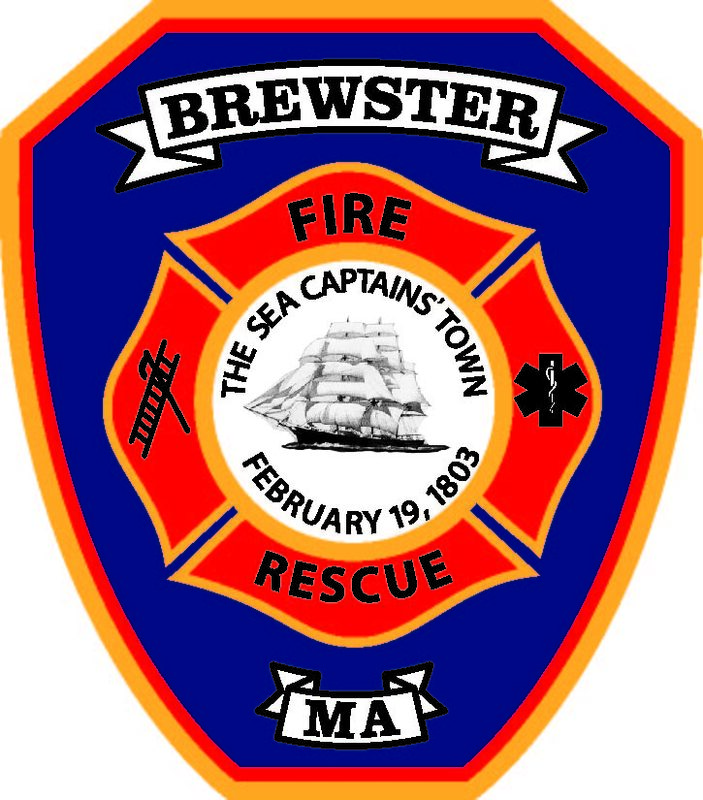 The Brewster units returned to quarters and were placed back in service at 4:47 p.m.
On Friday April 5 at 11:57 p.m. the Brewster Fire Department responded to the intersection of Main Street and A.P Newcomb Road for a reported single car motor vehicle accident. On arrival Heavy Rescue 241 and Ambulance 244 under the direction of Captain Anthony Dalmau located a vehicle off the road involved in a high speed head on collision with a large tree. Additionally, due to the violent impact of the crash the driver was found heavily entrapped within the cars passenger compartment. Personnel immediately implemented standard EMS protocols for serious trauma related injuries and began extricating the patient from the vehicle using the “Jaws of Life” and hydraulic cutting tools to detach the car doors and remove the roof to gain access to the entrapped driver. Due to the serious nature of the injuries and the ongoing complex operation the Captain requested a full department recall bringing additional resources to the scene. After approximately 30 minutes of extrication activities the driver of the vehicle was removed with serious non-life threatening injuries and transported to Cape Cod Hospital. The Brewster Fire Department would like to remind our residents of the availability of participating in our popular File of Life program. The File of Life is an extremely valuable emergency medical form that is used to assist responding EMS personnel in the event a patient is too ill or injured to provide life-saving medical information to our staff. The document, which is typically kept in a common location such as a homeowner’s kitchen refrigerator or other easily accessible area, includes critical patient care information such as the patients name, current medications, past medical history, physician information, allergies, and emergency contacts. We highly suggest that the form be updated and reviewed on a six month basis in order to ensure the most up-to-date information is available to our first responders. Our organization supports and highly encourages all of our residents in Brewster to use these life saving forms. Any individual interested in obtaining the File of Life package can visit Fire Headquarters or the Council on Aging Monday thru Friday 8:00 am to 4:00 pm. At 8:31 p.m. on Tuesday April 2 the Brewster Fire Department was dispatched to a service call for a reported boiler malfunction at 59 Thomegan Road. 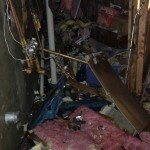 Upon arrival at the scene Engine 234 conducted an investigation of the basement area of the home and found the overhead garage door and the lower level of the west side gable end wall of the home pushed outward several feet and debris in the driveway from the force of a past boiler explosion. Further investigation of the basement found extensive interior destruction throughout the area including damage to a vehicle parked in the adjacent garage caused by large pieces of the furnace, debris, wooden partition walls, and storage being propelled throughout the area. 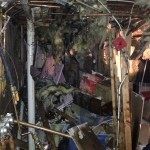 In addition, the 1st floor directly above the basement boiler room was dislodged and pushed upward. The fuel oil tank was found to be displaced from its normal position and a minor leak was present. Fire personnel immediately secured the electric to the building, plugged the leak from the tank, and spread speedy dry throughout the area to absorb the spilled fuel. 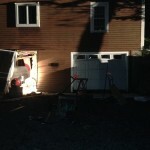 The Brewster Building Department responded to the scene to assess the structural damage to the residence. Based on the damage to the building, the fuel oil spill, and the utilities being shut down a determination to vacate the structure until a more thorough investigation could be conducted was made. NSTAR was contacted and responded to secure the utilities in the street and the DEP was notified of the fuel oil spill. Red Cross representatives were present and provided emergency housing for the residents of the home. All Brewster Fire units returned from the scene and were placed back in service at 10:15 p.m.
Over the past several months members of the Brewster Fire Department initiated a project to rebrand the department through the development of a new patch and logo. The purpose of this endeavor was to develop a patch that would bond the department to the community’s rich history and tradition, strengthen our relationship with our residents, and afford our personnel a fresh and contemporary outlook toward future organizational excellence and continued outstanding customer service. Personnel collaborated on and discussed several design possibilities including use of the Town seal or a community point of interest as the core component of the revised logo. 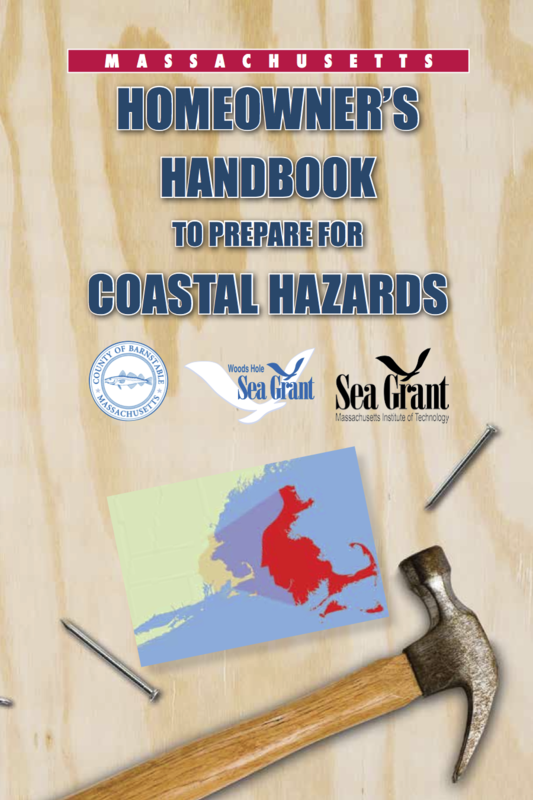 After much thought, members made the decision to incorporate an illustration of an original Brewster Sea Captains ship as the key element and central feature of the design. In doing so the organization was able to meet our objective of integrating a celebrated and renowned piece of Town history into our own rich tradition and heritage. Our members are extremely pleased to have enhanced the ties that bind us to the history of our community and look forward to continuing to provide unsurpassed emergency services to our residents under our new creative modern brand. On Sunday March 24 at 11:33 p.m. the Brewster Fire Department responded to 45 Cranberry Lane for a reported chimney fire. On arrival at the 1.5 story private dwelling Engine 234 under the command of Firefighter Glen Cefalo found an active fire within the chimney with flames showing from the exterior at the top of the flue. Based on these conditions a full department recall was requested for additional manpower. Ladder 237 and Car 231 arrived on scene with Car 231 (Fire Chief Moran) assuming command. The ladder crew placed ground and roof ladders to the roof and initiated clean out and suppression operations. Additional personnel arrived on Engine 239 and were assigned to the interior areas of the structure to check for fire extension and to remove the blockage from within the flue. 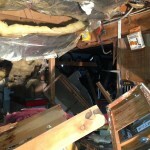 All living and attic areas were evaluated using the thermal imaging camera (TIC). This state-of-the-art equipment allows firefighters to search for heat sources and fire hidden within walls and other void spaces in the structure without causing structural damage. Our professional staff of firefighters was able to remove the blockage and fully extinguish the fire within approximately one hour with no extension into the building. Units were placed back into service approximately 1 ½ hours after the initial call. An interesting note about this fire is that the homeowner who was inside the residence at the time of the incident was unaware of the fire until a neighbor who saw flames and embers coming from the chimney quickly called 911 to report the fire. During this incident the fire department also responded to a Priority 2 medical call at which a mutual aid ambulance from Harwich transported the patient to Cape Cod Hospital. The Brewster Fire Department would like to take this opportunity to remind residents who utilize fireplaces and wood burning stoves to have their chimneys and flues cleaned and/or inspected by a professional cleaning service on an annual basis. Remember, preventing these types of incidents from occurring and causing damage to your residence should be a priority for every homeowner. Fire Department Community CPR Classes Rated A Huge Success! The Fire Department is pleased to announce that the recent community CPR classes provided by our organization in November and February proved to be extremely successful events at which 36 total attendees were provided training in adult, child, and infant CPR and choking, and the effective use of Automatic External Defibrillators (AED’s). Our instructor staff of Firefighter/Paramedic Kirk Rounseville and Firefighter/EMT Amanda Rounseville described the group as being extremely eager to learn and exceptionally dedicated to the program. Our organization would like to thank all of the attendees for their commitment to learning these life saving techniques, for assisting us in our efforts to saturate the community with residents capable of establishing an immediate medical response to a sudden cardiac arrest event, and for enhancing our status as a Heart Safe Community. Brewster Fire will be hosting additional CPR classes in the near future. Interested residents should monitor our website at Brewsterfire.com and local newspapers for dates and times.